There are at least two directions of globalization when promoting globalization of the university. 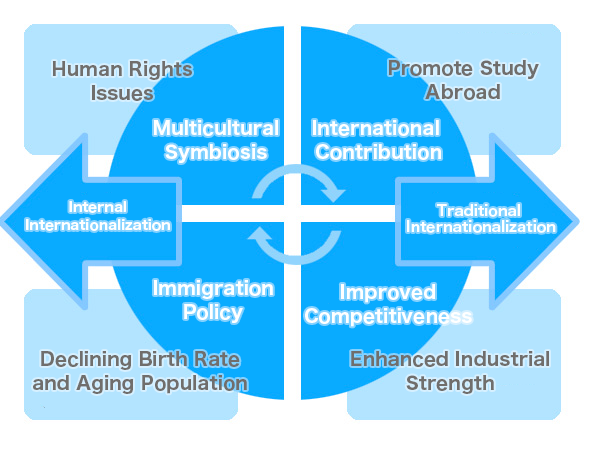 One is traditional internationalization which corresponds to active contribution to the international community and strengthening its competitiveness. In a country where the number of people related to foreign countries is rising while population continues to shrink rapidly, we believe that universities have a duty to develop human resources that are responsive to this “Internal Internationalization.” Meiji Gakuin University has so far been actively engaging in educational practices to meet external internationalization through strengthening English language education and study abroad programs. The objective of this project is to strengthen the “internal internationalization” beyond traditional framework such as culture, religion and ethnicity, and to help students understand the diverse values. Our mission is to educate our students to become bearers of a symbiosis society where it integrates people related to foreign countries and to become more insightful to immigration issues and its associated human rights issues. Through these efforts, we will contribute to the globalization of the Japanese society in the true sense of the word.